Being a small rural hamlet, Caldecott is an unlikely setting for a nuclear scare, but in 1995 nearly 900kg of Depleted Uranium was found dumped in a farmer's field! In January, a number of drums containing metal filings or shavings were found to have been dumped by woodland near to the Caldecott - Newton Bromswold road. The farmer sold three of the drum loads to a local scrap metal dealer who in turn sold them on to a metal processing dealer (ELG Haneils) in Sheffield. UK safety legislation requires that such metal processors have radiation detectors fitted to their equipment, to stop irradiated material inadvertently entering the supply chain. The arrival of three drums of low level uranium-238 triggered the alarms at the weighbridge and the subsequent investigation lead back to the dump site. Prof Tony Denman of Northampton General Hospital's Medical Physics Dept lead the local team, assisted by the Dept of Health and specialists from the UK Atomic Energy Authority at Harwell. Two of the remaining drums were found to be too corroded to simply lift onto a lorry, so the clear-up operation took several days, including the removal of topsoil. An empty drum that had previously been removed from the site by a farm worker for his garden bonfire in Chelveston was also recovered. Villagers and USAF families from the nearby RAF Chelveston housing annex (now Chelston Rise) were assured that the chances of contamination were slight, but a health helpline was set-up for those concerned. The local and national media covered the proceedings and questions were asked in the House of Commons. After the clear-up, an investigation by HM Inspector of Pollution (latterly the Environment Agency) traced the drums back to two firms (CSW Engraving Ltd and P Jenson & Co) that had been wound up in 1993. 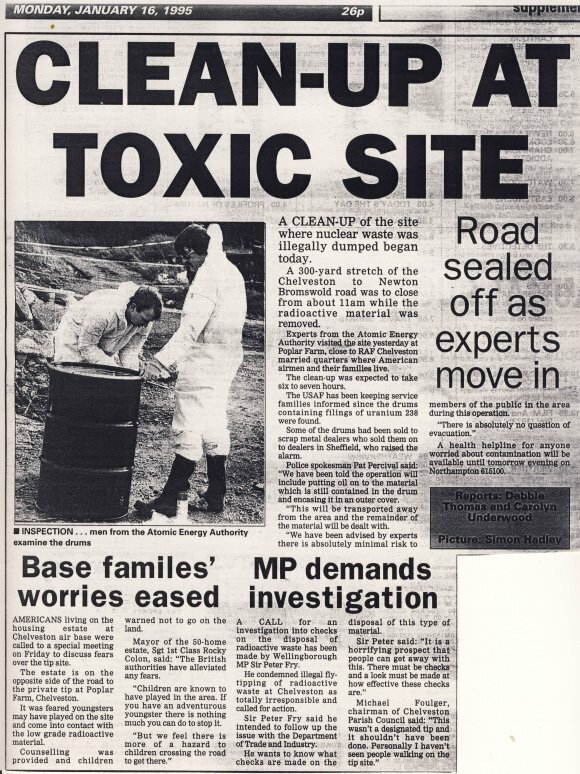 A director of the two firms, Jenny Seward, was subsequently convicted in 1999 under the Radioactive Substances Act 1993 (the first such conviction) of removing approx 0.5 tonnes of irradiated material from the failed business premises and illegally dumping it in the countryside in 1994. On his retirement in December 2007, Prof Denman commented that the Caldecott Depleted Uranium incident had been the most hectic two weeks of his career at Northampton General. Guardian Newspaper article covering the investigation and prosecution by the Environment Agency.